HEAVY MONTRÉAL: Lineup Announced for 9th Edition of Canadian Music Festival! WE’RE BACK! and we’re ready to bring you our HEAVIEST edition yet! Join us on Saturday, July 28th & and Sunday, July 29th at Parc Jean-Drapeau for the 9th edition of HEAVY MONTREAL presented by Coors Light. As a HEAVY Member, you can purchase your General Admission or GOLD festival passes right now! Do you love metal AND punk rock? Well, so do we! 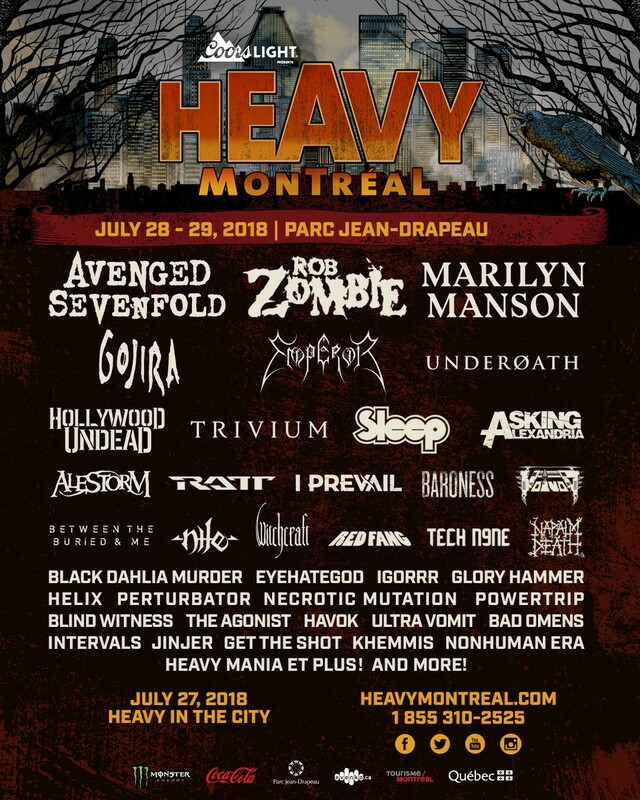 So that’s why Heavy Montreal and ’77 Montreal are teaming up to offer you a General Admission WEEKEND WARRIOR 3-DAY Combo Pass, with the possibility of upgrading to the HEAVY GOLD experience so you can attend both festivals and mosh all weekend long. Think you have what it takes? There’s only one way to find out. NEVER BEEN TO HEAVY MONTREAL? FREE ADMISSION for children 10 and under!